Haunted Houses in Canton, Ohio are some of the scariest haunted houses in America. Hauntworld.com tries to review only the best haunted houses in Akron, Ohio. When you are looking for simply the best, scariest, haunted houses in Ohio there is no other place to search than Hauntworld.com which offers our guests the best information to find Ohio Haunted Houses including the best haunted attractions in Akron, Ohio. There are many haunted houses in Akron that claim to the best haunted attraction but only one can truly lay claim to the being the scariest haunted house in Ohio... Haunted Schoolhouse and Haunted Laboratory in Akron, Ohio. NETHERWORLD will be in its 12th season this year, so it was back maybe 7 or 8 years ago I first heard the legend. That was about the time that many of the Ohio actors like Geoff Beck and Jeff Glatzer started coming to NETHERWORLD to act on the weekends. Since of course I never got to travel during the season, I would always ask them about the haunts they had visited on their travels, eagerly devouring tales of the long lost Hades Haunted House of Chicago, or of the mighty Erebus in Detroit, or of Bloodview, the home of the Legion of Terror. Over the years that followed others came from Ohio and scared with us in Atlanta, and they also had tales to tell, tales of the Legendary Haunted School House and Haunted Laboratory! Now at the time none of the actors whom I spoke to had actually worked there, rather they had GROWN UP going to the place! The more I heard the more I wanted to see it, and several times over the years I had almost hopped on a plane to finally check it out. Operating as a haunt since the 70’s they had inspired generation after generation of haunters, literally inventing the way a haunt should be built. My actor friends told me many things, of a giant Tesla coil, of a huge multi floor pit with a massive Frankenstein lab, of tons of dirt brought inside for the graveyard, of a pool of nasty water where a giant “worm“ would emerge to consume its prey, of floor after floor of killer sets with actors hidden in every imaginable way. Between the two haunts there were 7 floors it seems, a number I had become very familiar with. Many of the things I heard about the HSH and the HL fit very well into the legend of the seven story haunted house that was making the rounds back then, further firing my imagination. I would often talk to other haunters about the place, including Larry Kirchner, who used to travel the country hitting every haunt he could, but this was one he had never seen. One day a few years ago I was talking to Josh “Morgoth” Monroe, (a Cleveland haunt actor who later moved to Atlanta) about the biggest scare he ever had as a haunt patron. He told me in detail about a scene (I think it was in the Haunted Lab…) where a Pepper’s ghost used as a distraction set up a massive shock. Little did I know that a few years later I would get a behind the scenes look at that very effect! It was on April of 2008 I got the call from Larry Kirchner. He was on his way up to Kennywood Amusement Park in Pittsburgh PA the following week to install the new Ghostwood Estates dark ride and wanted to know if I could come up and work on it for a few days - for free! Hmmm… Get a last minute flight, book an expensive hotel, leave the family and head up to Pittsburgh for a high pressure Halloween Productions install when I was just getting rolling on my own haunt…for free? Hmmm…. Well I explained I was actually pretty busy, but I could tell by his voice that there was more to this conversation than he was letting on. He told me things about the dark ride that actually sounded pretty cool, and he even said we might get a chance to see Scott Simmons SCAREHOUSE in its new location. Well that certainly got me interested, I had known Scott for years as we had both worked at TV stations, and the latest stuff from his attraction was looking fantastic. But I could still tell Larry was holding more cards than he was revealing. Then he hit me with it… He had gotten a call from the Haunted School House and they wanted to open their doors for Hauntworld Magazine. And Larry, knowing of my fascination for the place, wanted me to write the article. 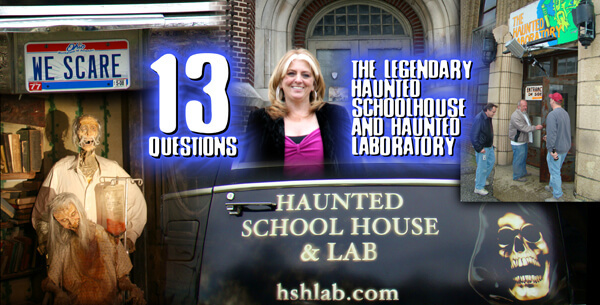 The Haunted School House and Haunted Laboratory - At Last! A week later I stood in Akron Ohio, pelted by a cold light rain in the parking lot between the two amazing buildings that housed The Haunted School and Haunted Laboratory! The last few days had been a blur - late nights at Kennywood placing props in the Ghostwood Estates dark ride, a tour of the SCAREHOUSE (awesome!) and their “Secret Bowling Alley” but that is a tale for another day. Larry and I had just driven up and now we stood before the haunts I had heard so much about for so many years. Greeted by Cindy Johns, Vice President of the event, we were taken to the backstage actor areas of the Haunted School House. Enormous detailed murals adorned the rooms featuring armies of ghouls emerging from the haunts. New custom creatures for this year’s events were on display, along with assorted parts from the massive Tesla coils from the Haunted Laboratory, ready for off season servicing. Nearby stood a costume room FILLED with an amazing collection of premium masks and costumes, and across from it was the well equipped make-up area. Several actors in gory slime-drenched make-up awaited us, including their key creature creator Bill Morrison. Then accompanied by construction foreman, right hand man and set designer Paul Diefendorf we ascended three flights of stairs to begin our tour. Soon we would be joined by Don Johns, the owner of the event and delve deeply into the amazing secrets behind the Haunted School House and Haunted Laboratory! From the beginning I could tell we were in for a special treat! The Schoolhouse/Lab had an old style design, with detailed sets on one side of a rail and the customer’s path on the other. It was very different from most of the haunts I had seen over the recent years, and almost refreshing to see a style long abandoned for the now more common “walk through the scene” layouts. This design allowed very intricate monsters, set pieces and lab equipment to be used that would have been destroyed by guests in haunts without rails, and really focused the patron’s attention on a specific angle of view, almost like a movie gives you a perfect “shot.” They explained to me how the actors had a totally separate path from the guests to enter and exit the scenes, and how almost every set had a platform above it for management and security to watch the action from above. The amount of complexity in the back corridors and catwalks was amazing to allow almost three paths (Actors, Management, and Guests) to wind through and above the event! The use of actors seemed to be mainly by elaborate distraction, concealment, and sudden reveals taken to a whole new level. In many places realistically placed dummies and props allowed actors to blend completely with the sets, or in some cases, just parts of the actors. One example was a Scarecrow scene, as only half of the actor was visible (seen as the torso and arms of a ripped up scarecrow) while the rest of the character was hidden in the floor. That was the last prop in the room anyone would suspect! In another the actor’s head protruded from a crate of pumpkins, and then the crate’s side was used as a massive bust out. The focus on the scene behind the rail was also used in some cases to distract from a scare above and behind the guests, especially in cases where illusions or jaw dropping sets were used to create absolute distraction. It was clear to me that they had spent decades honing and perfecting the craft of concealing actors, almost assuring rock solid startles for the throngs of visitors attending every year. There were also some interesting uses of puppetry, my favorite being George the talking skeleton. He sits on a toilet in a detailed bathroom scene gibbering away at the guests, a cover for an unexpected surprise. Although my visit was in the off season without staff it was clear that the entire focus of this place was to set up the guests with great sets so the actors can scare the stew out of them! Another area of absolute wow was the quantity and quality of unique monsters found in this event. Many haunters buy the same props and animations at the tradeshows every year, this is a common thread that binds many events together from a stylistic standpoint. Not so the HSH and HL! The vast bulk of their creatures and animations are absolutely custom items made in a very unique way. From small fragile things to massive giants these props and animations are hand built from foam, paint, resins and found items in such a way to create totally surreal yet somehow amazing realistic characters. Most of them are equipped with reflective eyes, wet looking skins and intense elaborate paint jobs sure to stun detail lovers everywhere. In the School House these beasts tend toward the more traditional - vampires, zombies, giants, twisted circus freaks and monsters of almost every description. In the Lab however they attain an absolutely other worldly style, with fragile appearing yet massive aliens, dozens of man sized pods suspended from the ceiling, a giant mosquito, odd snakelike tentacled lab experiments, multi eyed horrors, etc. At NETHERWORLD as many of you know, we are avid creature creators, collectors and modifiers so let me say I was very, very impressed! Just seeing this incredible collection of beasties would make a trip to this place worthwhile, but the sets they inhabited took the event above and beyond. The style of propping out and designing the scenes was excellent. Rather than rely on new bought items, most of the things on display were old grimy antiques, or skillfully designed to appear that way. 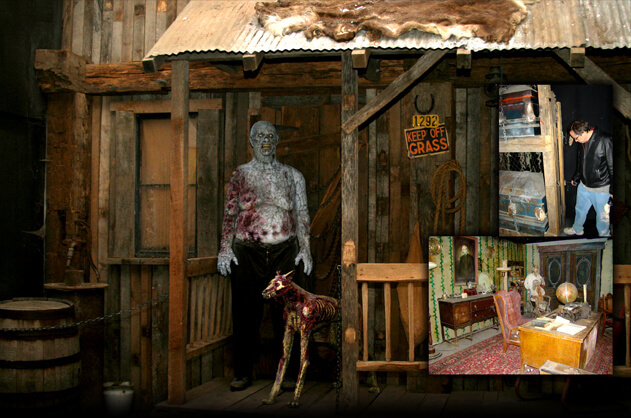 In more rustic style areas of the haunts worm eaten barn wood and rusted metal supported old ropes, rotten steamer trunks and ancient tools, providing an extreme level of realistic decay that resembled the outside areas of Haunted Hoochie in Columbus. On the entry level of the Haunted Lab for example, an entire barn had been built detailed to the bone, housing a grisly zombie farmer and his long dead dog, glowering at the queue line. In more fancy sets, antique desks and wardrobes were staged filled with actual period books and knick knacks creating an absolute sense of place and time, rivaling the antique collection at the Darkness in St. Louis. In the many lab and electronic scenes, the Jacob’s ladders, extensive chemical glassware, strange equipment busting with vacuum tubes and truckloads of bizarre medical equipment reminded me of the famous Frankenstein lab at Rocky Point, the lab areas of Verdun Manor in Texas, or the new asylum at the 13th Gate in Baton Rouge. In the area of realism there was one sequence that had something I had never seen in a haunt before. They had a garage set with the back of a truck sticking out from under the half closed garage door (a trick to confuse guests, as around the following turn was a truck that honked and drove toward visitors. The first truck was there to make you think you had seen the source of the honking and conceal the next scare.) The details were great, hose and spigot attached to the garage, power lines running to the building, every bit of junk you might expect in a scene like that…and REAL grass planted on the lawn! Every year they plant fresh grass on that lawn, creating an earthy green smell and growth pattern that is absolutely real! All totaled there were 7 FLOORS full of haunted house sets, a staggering array of detailed scenes built up over many long years. In a general sense they stuck to no clear theme, although occasionally there would be a run of related rooms. Every floor it seemed had a few massive sets that really stood out as the big eye catchers, followed by tighter environments where you were much closer to the action. - The Giant Room - In the center of this tall room on the top floor of the HSH was a custom giant that made the classic Distortions Giant look small. Flanked by piles of bones and sporting a massive glob of green mucus it would rise up over the guests as a concealed actor busted out of a hidden door at them. - The Graveyard - Midway through the HSH was a huge graveyard filled with dirt. There must have been truckloads of the stuff in the two story room, at one point creating a hill we would enter. A huge crypt building was set at one end and many custom monsters lurked in the darkness. - Dracula’s Castle - Another two story set features a grand staircase going to the upper level balcony, and a castle like setting in the lower level. Massive doors, a fireplace and an army of detailed creatures awaited guests. - The Spawning Pool - In the basement of the HSH was an entire section built up like a castle dungeon. Realistic concrete coated rocks covered every surface, and a series of stunning scenes were revealed in the torch like lighting. One area had opening and closing iron gates, another had a deep sewer-like well and yet another conceals the watery home of a man eating monster! As guests look into a pool of murky water a huge worm emerges from the bubbling slime to snap at what is left of a corpse swinging just out of its reach! - The Wind Tunnel - On the top floor of the HL is a scene that is unique among any that I have ever seen in a haunted house. From a catwalk you look down a huge FOUR STORY pit! Below are the remains of each story of the building, with desks, chairs, and other furniture literally clinging to the broken timbers sticking out. The effect is as though a huge meteorite crashed though the roof leaving a pit four floors deep and maybe 30 feet in diameter! The remaining parts of flooring have a checker board pattern, and well placed strobes make looking down at the carnage very disorienting. I am told that during the season, lasers and fog accentuate this wild display. At the bottom, almost out of view is a spinning vortex tunnel on the lowest level. Seen from above, the spinning metal disks and the black fabric look almost like a strange grinder, further removing any desire to look into the pit! - The Tesla Lab - One of the things very well known about the HSN and HL is their use of massive Tesla coils. For those not familiar with these Frankenstein like devices, they are basically huge transformers capable of producing massive voltages (over one million volts), and firing blasts of electricity in the 10 foot + range on larger coils. This event has two of them! On the roof is one coil, a terrifying beacon to gather attention and a warning to those standing in line outside the event. The second resides in the massive Tesla coil scene located towards the end of the Haunted Laboratory. This is a vast multi story room filled to the brim with scientific instrumentation, and in the center is an solidly built circular Faraday cage that surrounds the coil. Thus guests must go completely around the coil as huge blasts of energy are directed at them, stopped only by the grid like framework of the Faraday cage. Having this level of elemental fury directed at you is an intense experience not to be missed! After several hours of in depth exploration of this haunted facility, and a hearty meal provided by our gracious hosts it was time to head out into the rainy Ohio night and off to Pennsylvania and Kennywood. As always when I see an event of this caliber, my mind was swimming with all of the things I had experienced. The place was clearly one of the first major haunts to exist anywhere, and it was as if it had developed on its own, unaffected by the trends and styles of haunting that have come and gone over the years, an awesome self-made event with few peers. I saw in it many ideas and scares in pure forms that have doubtless been cloned by other haunts and vendors and spread all over our industry, making it one of the veritable progenitors of haunted houses across the country. One thing was clear; it had surpassed its legend. The quality of props, the unique creatures, the wild sets and the sheer weight of history made it an icon every haunter should experience. Thanks again to the producers for allowing us this special glimpse! Oh and by the way…I didn’t tell you everything I saw! Some secrets must be kept…go and see it yourself…If you dare! 1) How many years have you been in business…How did you get started? There were a several haunts in our area that started a few years before our haunt like Scream in the Dark in downtown Akron. My husband Don Johns so thoroughly enjoyed dragging my screaming, panicked, trembling, body through, but he felt he could do a better haunt, so he has spent the last 35 years trying his best to prove it. This will be our 35th season at the Haunted Schoolhouse and the 28th season at the Haunted Laboratory. Over two million visitors have walked the halls of these haunts in the 35 years we have been doing business. We opened the Schoolhouse in 1974 in the former Thomastown Elementary School. That first year we had made arrangements with Akron’s Board of Education to rent the building for two months with the option to buy at the end of our short lease, and as the saying goes, “the rest is history.” That first year we had a total of 30 days to design sets, purchase and make costumes, arrange all advertising, acquire insurance and hire all the employees necessary to operate our show. We certainly had a great challenge with our limited time table and I must say we learned a lot the hard way that first year. That first year was successful from a financial standpoint, but we made some mistakes. Those mistakes taught us what not to do in the future. In 1981, we purchased the building right next door, the old Guggenheim Air Institute. 2) How does the Lab differ from the Schoolhouse thematically? The buildings each have their own unique ambiance and histories. The Schoolhouse uses more classic horror filled with loads of iconic monsters roaming the hallways. Thomastown Elementary School soon evolved into The Haunted Schoolhouse and has become a showcase for classic horror monsters, those of legend and folklore. Through the years the 7 floors contained in both of our haunts may have created a few legends and folklore of their own. 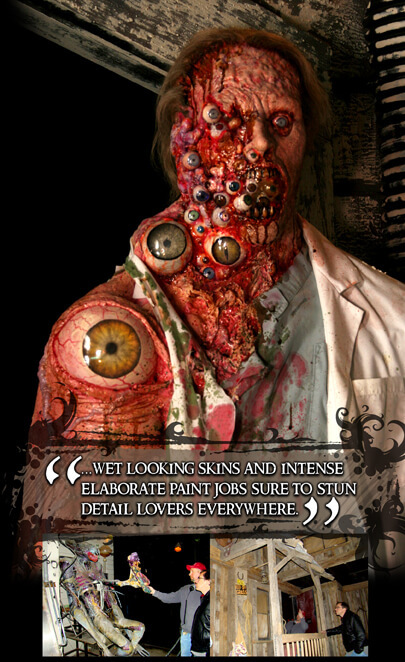 The Laboratory prides itself on unrivaled special effects to give that appropriate sci-fi feeling. It was a natural transition for the old Guggenheim Air Institute after years of contribution and experimentation to the scientific community to The Haunted Laboratory. The experiments conducted within these hallowed halls now have spiraled horribly out of control and not of this world. It is commonly believed among staff members working at the Lab that something or someone still haunts these buildings. 3) Your massive Tesla coil is legendary…how long have you used it? Does it require a lot of maintenance? We added the Tesla coils to our show in 2001. They certainly have added a whole new dimension to The Laboratory. The outside coil cannot be used in high humidity or of course when it’s raining. We have had to ship these effects back to California for maintenance several times, and as you can imagine, this isn’t a cheap thing to do. 4) There are many unique and breathtaking sets in your haunts. Where do you get the inspiration for them? Passion is the key ingredient in anybody who joins our Dream Team. The haunted house industry takes a special kind of person with a true passion for their work – and that’s what we look for in our actors, management and artists. Our inspiration comes from movies, dreams, nightmares and creative meetings where our crews lay out all their scariest thoughts. Sometimes looking at a prop like an old dresser can bring an idea for a scene. 5) Over the years you have developed many unusual ways to scare your guests….What are some of your favorites? Sending a million volts of electricity 16 inches from their heads, while the crack of electricity and the boom of thunder permeates the air. 6) How much real dirt did you bring in for your graveyard? The first graveyard set we created in 1974 we actually brought in 16 tons of dirt for the set. These days we add a thinner layer of dirt over forms we create resulting with that earthy effect. 7) Your haunts have many unique monsters - Do you build them in house? Most everything we do is created in-house. We have a very imaginative staff who can build some amazing things out of stuff that’s just laying around. I am sure, that as we do, many haunters are also collectors of junk because most anything can add to a set. It goes back to the old saying, “one man’s junk is another man’s treasure.” The monsters simply evolve from the imaginations of our staff. You know the staff has done their jobs when the fake monsters seem to come alive. 8) Have you ever considered selling props to other haunted houses? 9) What are some of the fan favorite scenes in the haunts? The fans at the Lab love the Tesla coils of course, and the catwalk that takes the public though the four-story wind tunnel. Our fans love the black spinning hole we designed ourselves, along with the attention to detail in both houses and scares around every corner. The Schoolhouse favorites tend to be the van that rushes out at you in the dark, the scarecrow set, and George the talking skeleton. Not to mention our classics including Dracula’s castle, the cemetery and a walk through a casket that takes visitors down into the wet, damp, dark dungeon. 10) Many of the sets are massive. Do you change the haunts much year to year? We make changes every year to all floors in both of our buildings. The more major sets take a lot of time to create so we cannot change them out every year. While we are already working on changes for the 2008 season, we have many more exciting and innovative changes for our 2009 season in the works. 11) Entire generations of haunters have grown up going to your events. Do you have many haunters tell you stories of their childhood experiences in the Schoolhouse and Lab? We actually have monsters working for us now whose grandfathers worked for us when we first started. The public really does like to reminisce about their experiences as they come though the ticket lines. They enjoy bringing back not only their children, but eventually their grandchildren as well. We have found though marketing surveys that the majority of our customers who come to us are returning customers with many coming based on word of mouth. We believe we have become a Halloween tradition, which was one of our goals when we first started. 12) Any haunt is only as strong as its core crew members. Who are some of the key staff members that keep your haunts looking so good? We have a very devoted core of people who we have worked with for years. Don, of course, is the head dreamer and designer. He relies heavily on his right-hand man Paul Diefendorf along with our very talented in-house artist, Bill Morrison. Through the years we have had many people leave an incredible mark in the tapestry that has become the Schoolhouse and the Lab. I would be remiss if I didn’t include the contributions made by some of those key players. George Tepus was with us for 27 of those years and now owns his own construction company, Don’s brother Danny, who passed away some years ago, also played a big part in what we have become. I have (Cindy Johns) contributed in early years, to set design with Pete Tepus who now lives out in LA. Greg McDougal has also added his own special flair and talents to our show; he is now out in LA as well. Several others, who have been with us for years, continue to deliver their various talents to the attractions. These people include John Johnson, Doug Colbert, Fred Coladonato, Ryan Haidet, Dave and Aimee Dennison, George and Debbi Weitzel, and James Goble. We have a wonderful staff of supervisors who act as quality control for our show. Many staff members return year after year, too many to mention, but definitely the heartbeat of our show. 13) Any new scenes for 2008 we can look forward to? We have to keep some things a secret. There is something fascinating for our fans the first time they walk into one of our new scenes. We’d like to keep it that way. So stop out and see what new scares we have in store. Stay up to date on the latest happenings at the Schoolhouse and Lab by visiting www.hshlab.com or becoming our friend on MySpace at www.myspace.com/hshlab. You can get all our dates, hours, exclusive photos, videos and other frightful features there 24/7. At the link above you will find over 100 haunted houses in the state of Ohio.